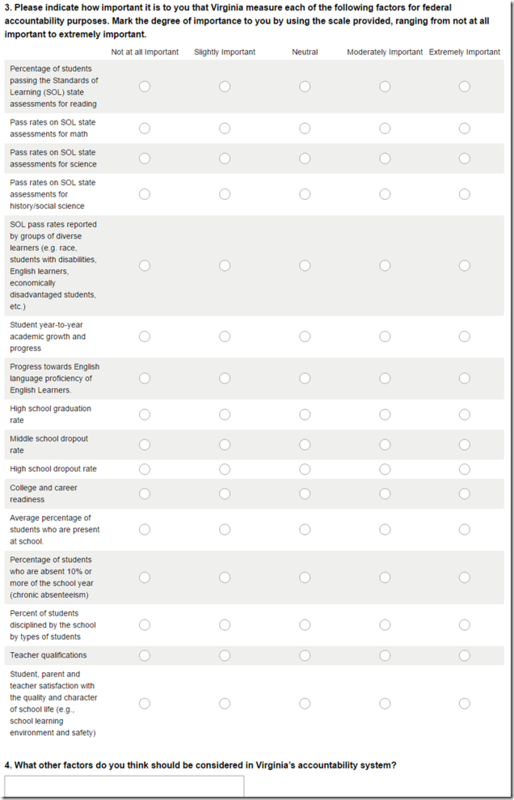 There are fourteen questions about matters such as pass rates, academic growth, graduation rate, dropout rate, etc. 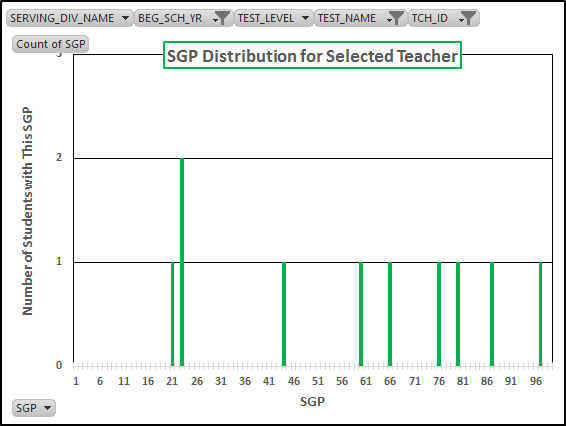 Then, second from the bottom, there is one about the crucial element in school success, the teachers. 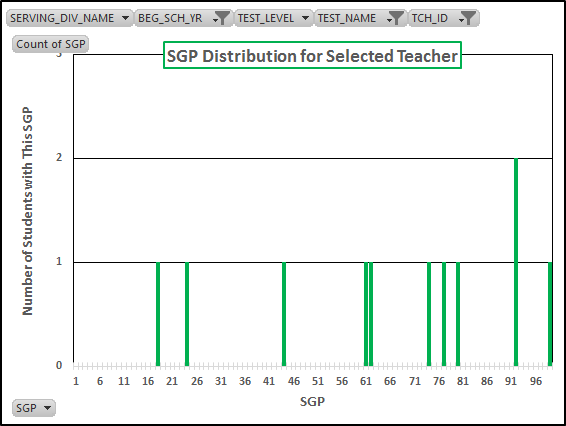 But Our Leaders fall back on the old, misleading stupidity of measuring inputs and ignoring outputs: They ask about teacher credentials, not teacher effectiveness. 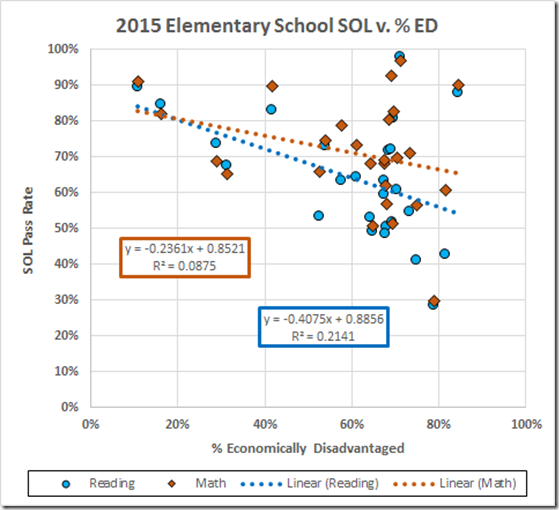 It is clear that SOL performance decreases with increasing poverty. 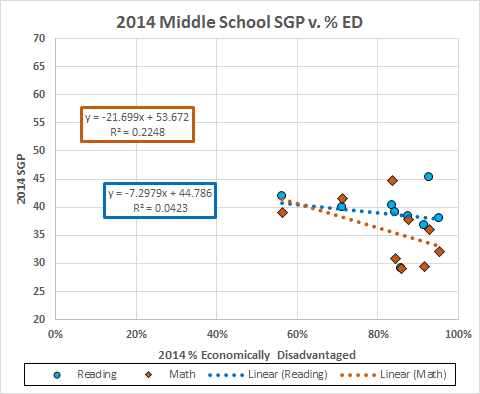 Under the federal prod, VDOE began calculating Student Growth Percentiles (“SGPs”) that were essentially uncorrelated with economic disadvantage. 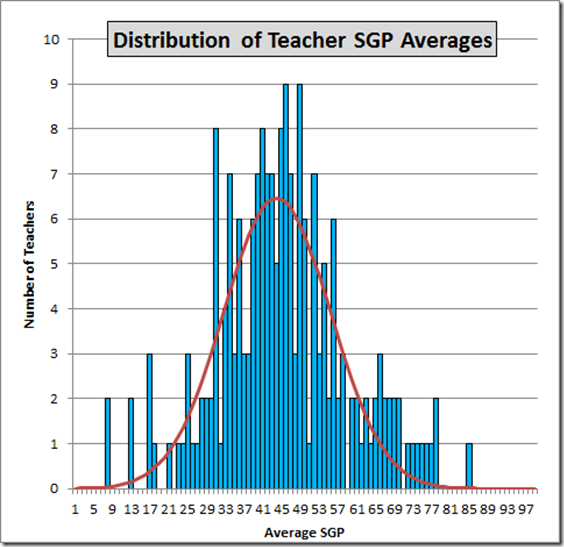 The SGPs proved to be embarrassing to the Virginia “Education” Association and VDOE: They allowed a clear measure of teacher effectiveness (see this and this). 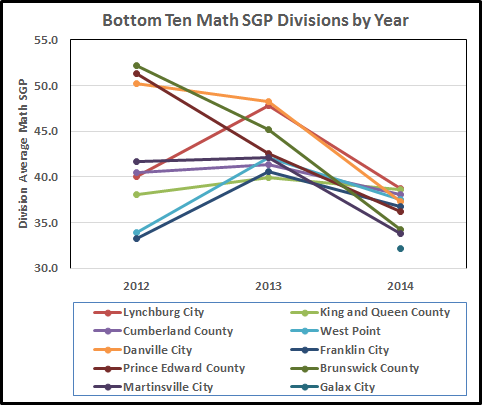 So VDOE abandoned ship and introduced “Progress Tables” that roughly measure student progress but mostly ignore the lack of progress. 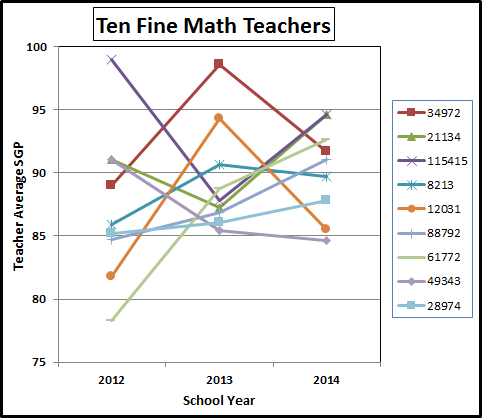 Now they ask about the importance of teacher credentials (that do not measure teacher effectiveness) but they ignore even their diluted measure of teacher effectiveness. Guess what: You and I get taxed to pay for this deliberate sidelining of the most important public influence on our schoolchildren, teacher effectiveness. 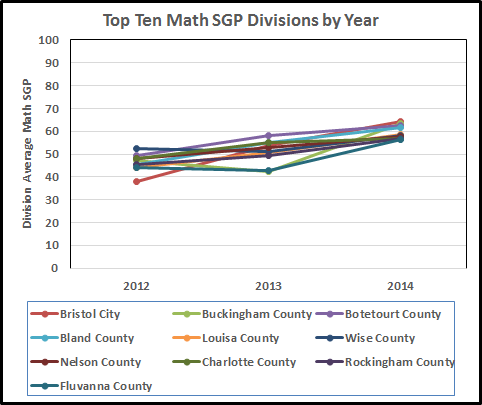 The June, 2016 Post from our Superintendent discusses at some length the results of the current (2017, based on 2016 data) accreditation results. 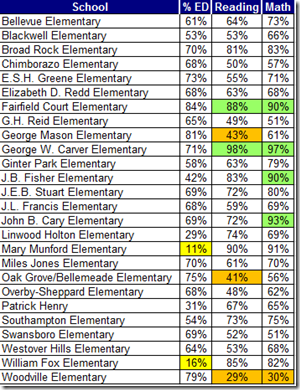 The VDOE Accreditation page, last updated on Feb. 29, 2016, shows the data from last year but not the current numbers. 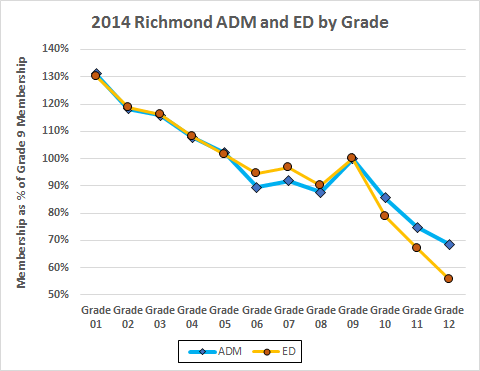 Why do you suppose that the Richmond Superintendent had those numbers some time last month but you and I still cannot get them? 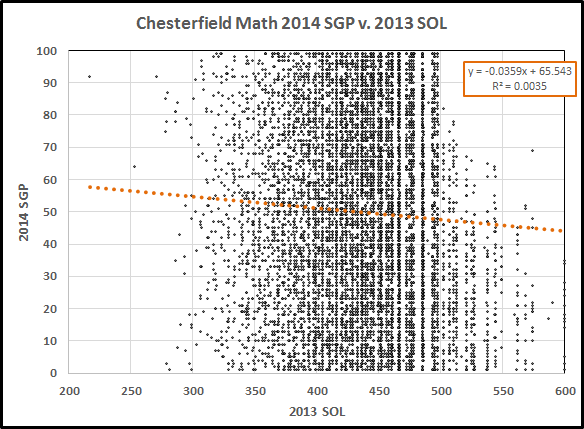 Indeed, why do you suppose VDOE could use the SOL data to assess accreditation in June (or before) but cannot use the same data to calculate SGP until Fall [pdf at slide 2]? Stay tuned while I try to find out. 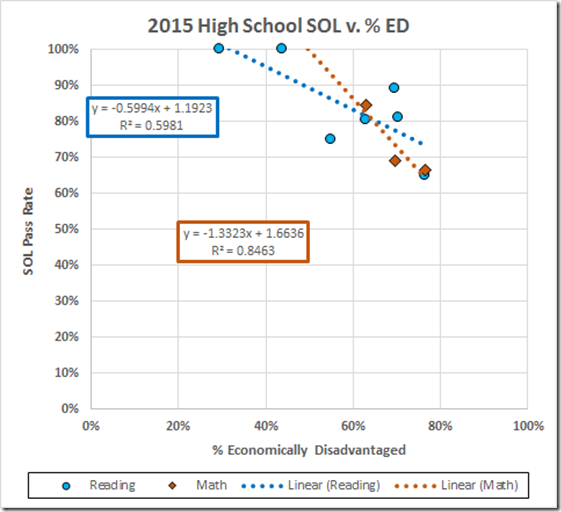 We’ve seen that division SOL pass rates fall with increasing economic disadvantage. 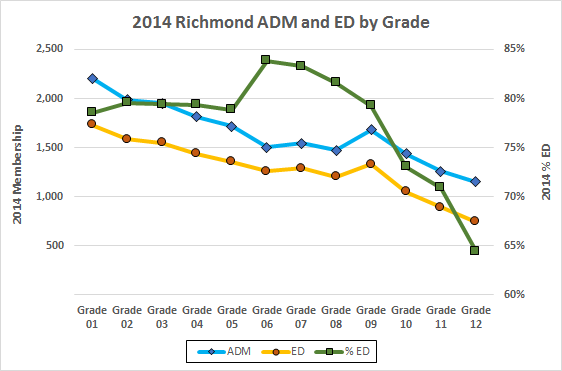 Those data also suggest that Richmond’s gross underperformance is not explained by the economic disadvantage of the Richmond students. 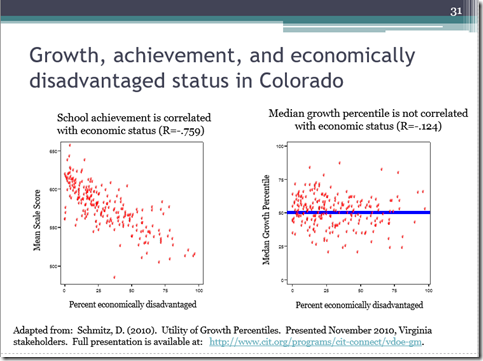 Note: Franklin has both middle and high school grades; I omit it from the graphs because it does not directly compare to either kind of school. 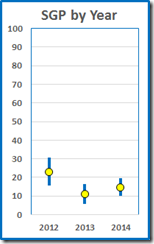 Caveat: Correlation is a necessary but not sufficient condition to infer causation. 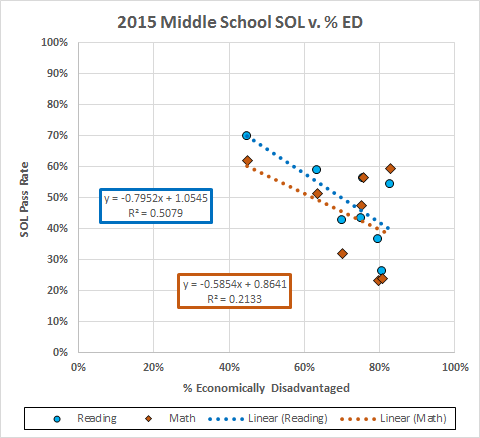 The other thing to notice about the middle schools is the very low pass rates. 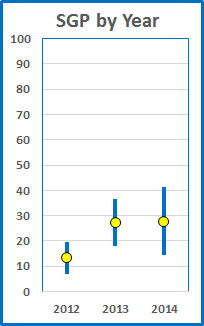 Here, for reference, are the average pass rates by grade. 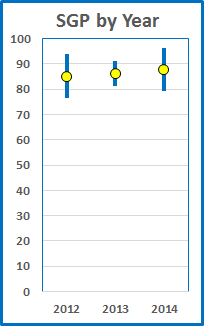 The horizontal lines are the reading and math “benchmarks” for accreditation. Why do the middle schools get much lower SOL pass rates with mostly the same kids as the elementary schools? 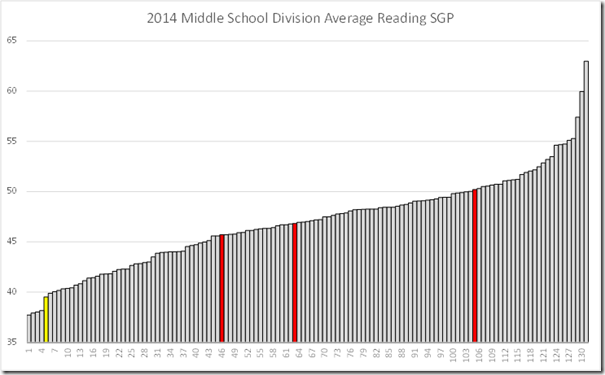 Let’s infer that the middle schools are doing a much worse job. See below. 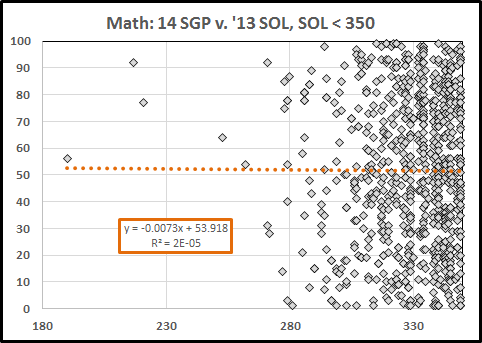 In any case, the R2s imply that the SOL is affected, especially in the middle and high schools, by economic condition or something related to it. 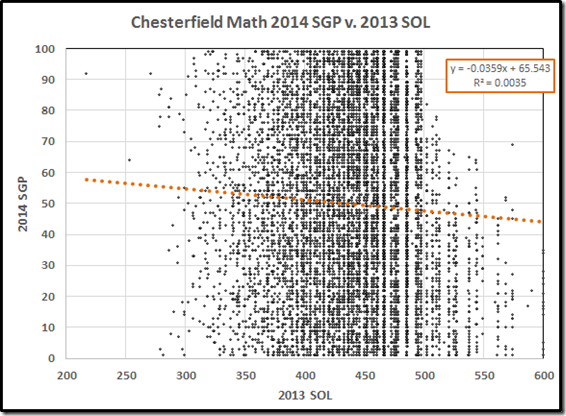 The Student Growth Percentile (SGP) was supposed to remove that correlation so I turned to the latest available data, the 2014 data by school in the 2d download from VDOE in response to Brian Davison’s suit. 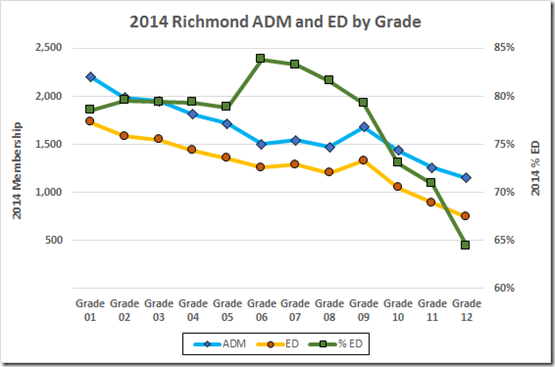 There are no high school reading or mathematics data for Richmond in that dataset (EOC Algebra I only) but the elementary and middle school results are compelling. 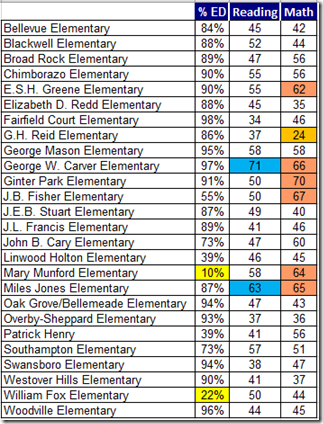 Here we see our elementary schools performing at bout the 50th percentile on math and a notch lower on reading. 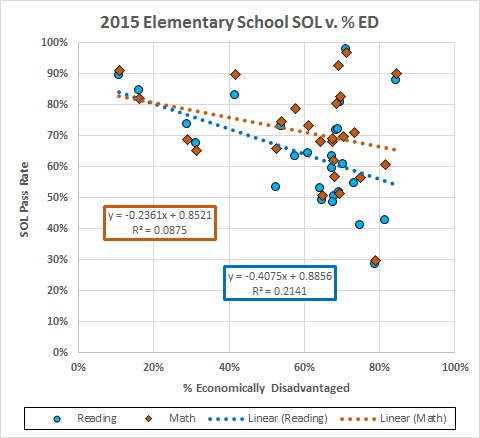 Those performances were mostly uncorrelated with ED (reading R2 of 1%; math, 3%). 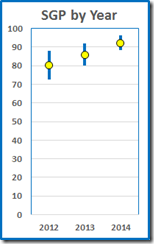 The Good News: These learning measures, esp. the reading, are a bit better than the SOL pass rates might suggest. 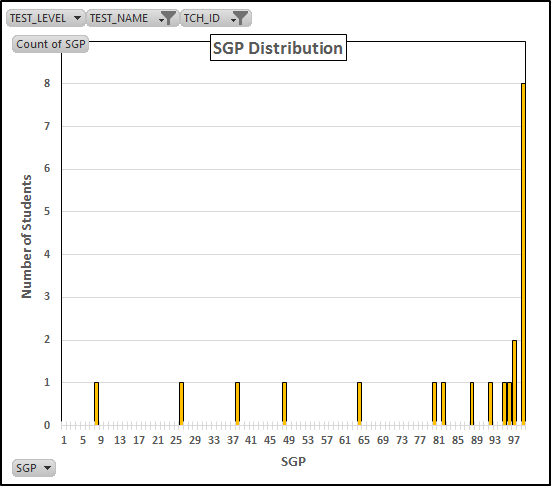 The school with a reading SGP of 71 (!) is Carver; the 63 is Jones. 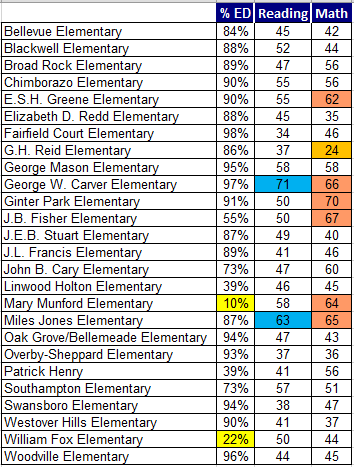 As to math, we have six schools above the 60th percentile (Ginter Park at 70; Fisher, 67; Carver, 66; Jones, 65; Munford, 64; and Greene, 62), with Reid in the basement at 32. 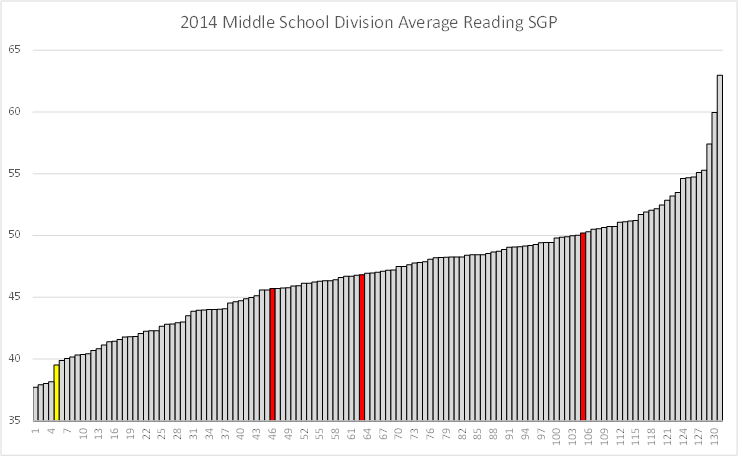 That collection of reading STPs just under 40 is not encouraging. 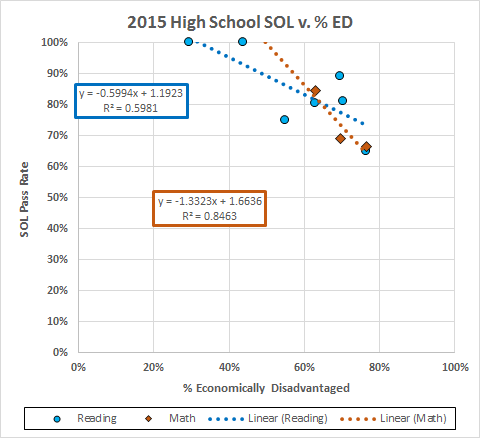 Caveat: These data use the whole school %ED from the Fall census. 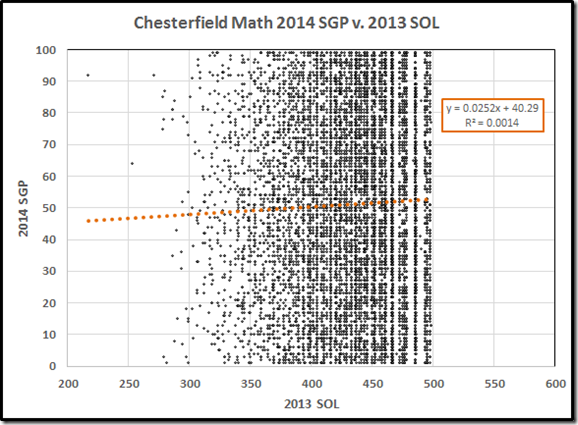 The VDOE data would allow calculation for only the SGP grades, 4 & 5, except that their data suppression rules give blank ED values for Munford and Henry by suppressing the fifth grade data (fewer than ten kids reported). 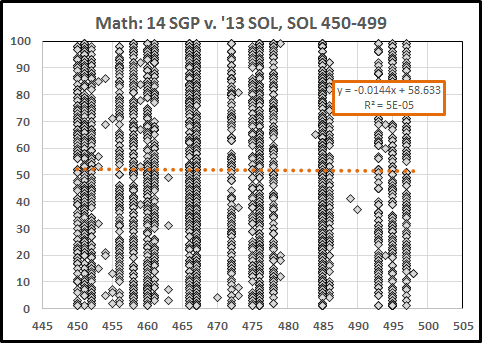 The totals are larger than the sums for the individual grades and presumably include all the ED students so I’ll stick with the (presumably undoctored) total data. 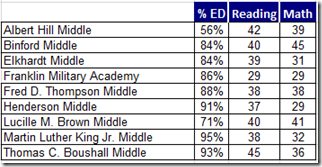 The two very low ED schools are Munford at 10%, performing well above the 50th percentile, and Fox at 22% ED scoring at the 50th percentile in reading but only the 44th in math. 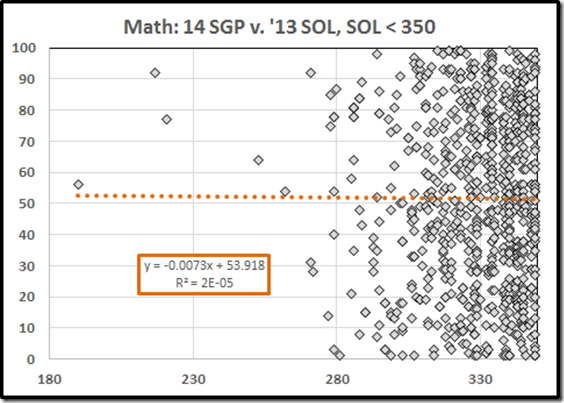 This makes it look like those nice SOLs at Fox are the result of smart kids who are scoring well but not improving as much as the smart kids in other schools. 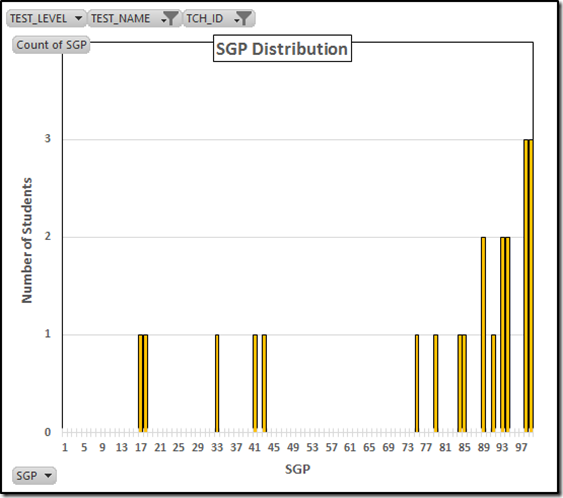 The 24th percentile score in math is Reid. The conclusion: On the 2014 data, our elementary schools are doing an average job, on average. 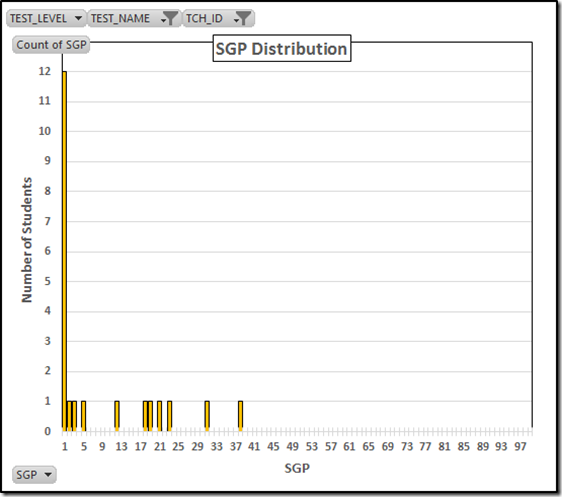 There’s work to be done at Reid and some others but, all in all, the SGPs report more learning than the SOLs might suggest. 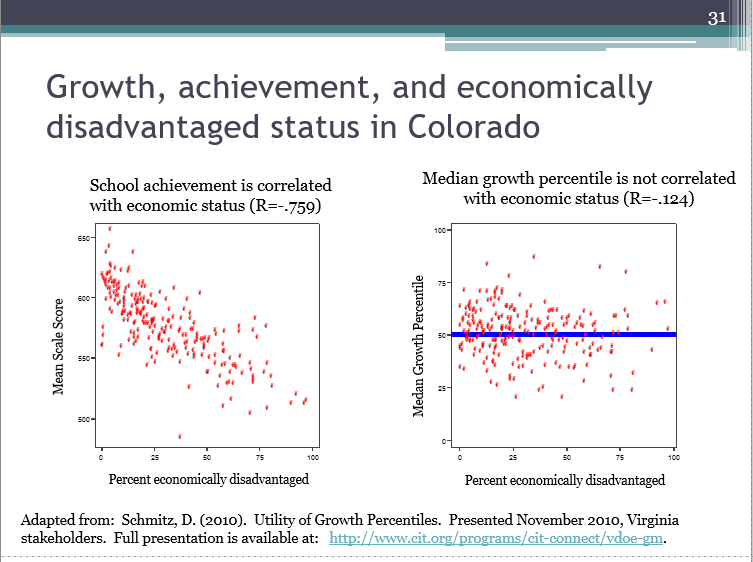 And how much the kids learned was generally unrelated to economic disadvantage. 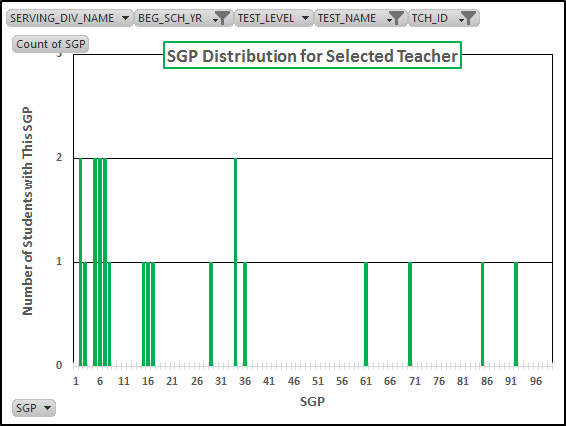 The database let me pull the 6th, 7th, and 8th grade data so I’ve included Franklin. 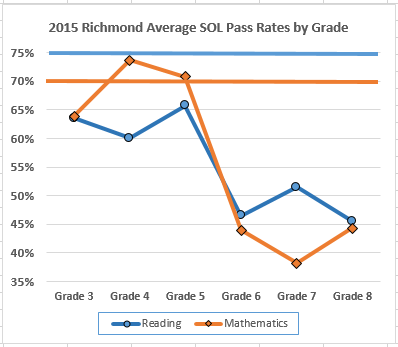 Note the low average performance and the modest correlation of the math scores. 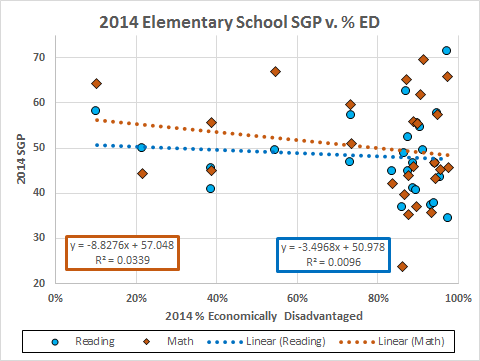 Also notice the absence of schools with low ED populations. 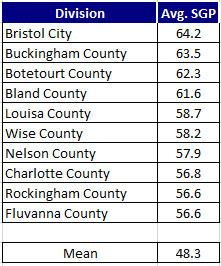 As to that last point, these data raise the question whether those low ED kids from Munford and Fox have dropped out or gone to the Counties or to private schools for middle school or whether their numbers just disappear into the average. 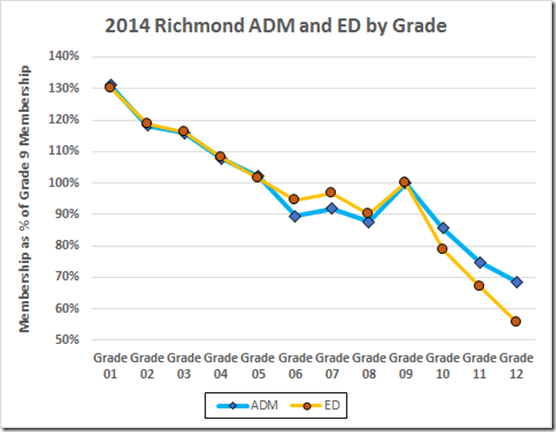 VDOE publishes no data on kids who drop out before entering middle school The data they do share indicate zero dropouts from grades 7 or 8 in 2014. That seems unlikely but it’s all the information we have. 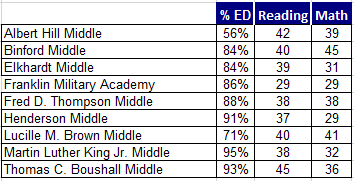 We are left with the possibility that the middle school drop in membership and rise in %ED reflects some of the more affluent kids fleeing to private schools and to the Counties. 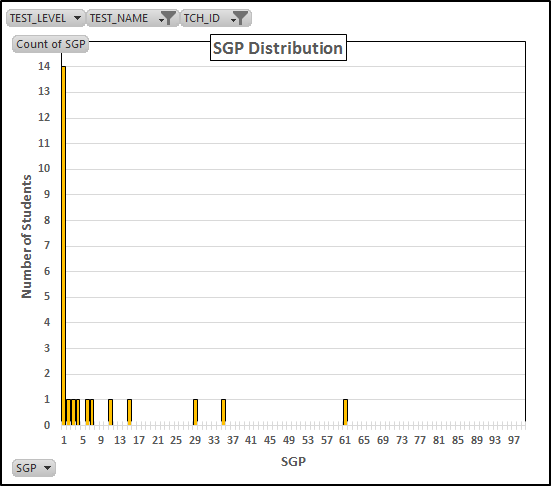 The precipitous drops in both total and ED membership after the 9th grade surely come from dropouts. 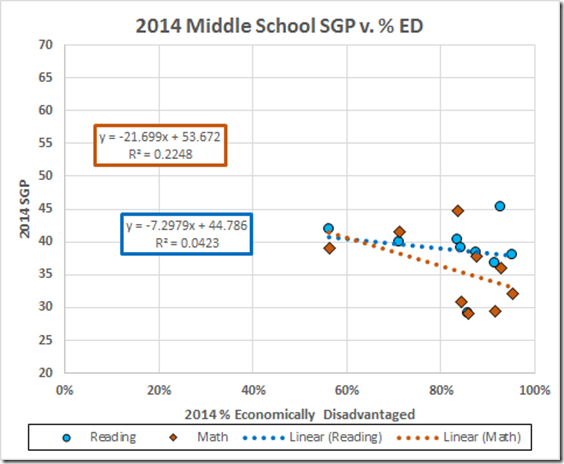 But to revisit the major point: The low correlations with ED tell us that the low middle school SGPs can’t be caused by the increased economic disadvantage; the leading candidates for those lousy SGPs, then, are lousy teaching and/or lousy administrators who fail to control the middle schools. 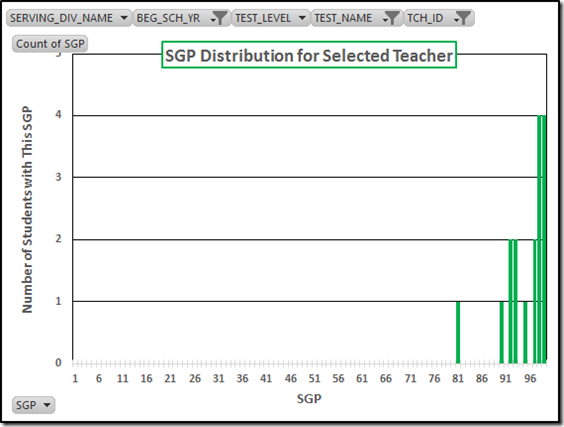 The other point here: The State Department of Data Suppression has stopped calculating SGPs, which leaves us with the manifestly flawed SOL data to assess school (and teacher) quality. 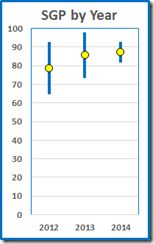 It seems we’ll have to wait until late summer to see whether they are going to release or suppress their new progress (aka “value”) tables that measure academic progress (but mostly ignore the lack of it). 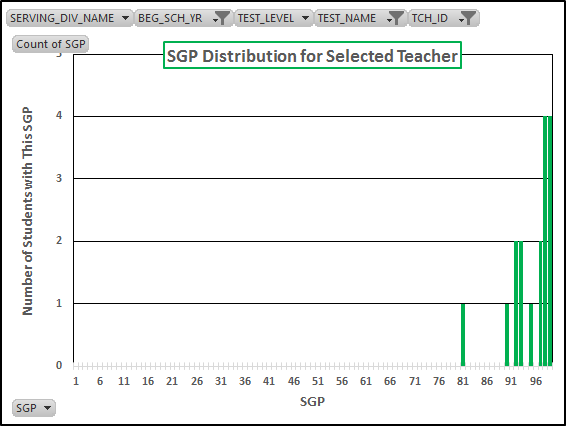 In the discussion of the SGP data that Brian Davison sued out of the State Department of Data Suppression, I’ve been focused on the awful teaching (e.g., here, here, and here) that the Virginia Department of “Education” and the Virginia “Education” Association have been attempting to conceal. 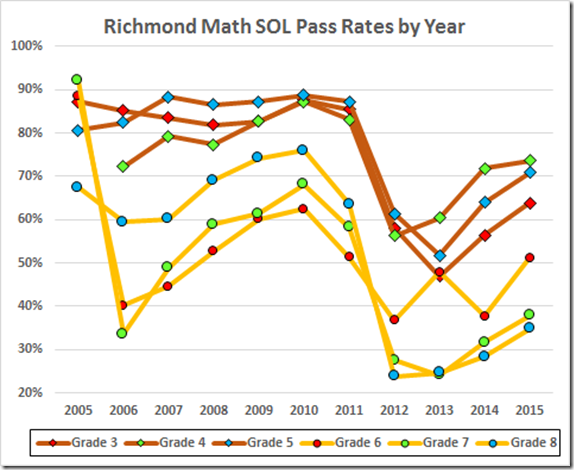 But their efforts to hide teacher performance data from the taxpayers who are paying the teachers have another outrageous effect: They suppress the identities of the many great teachers in Virginia’s public schools. 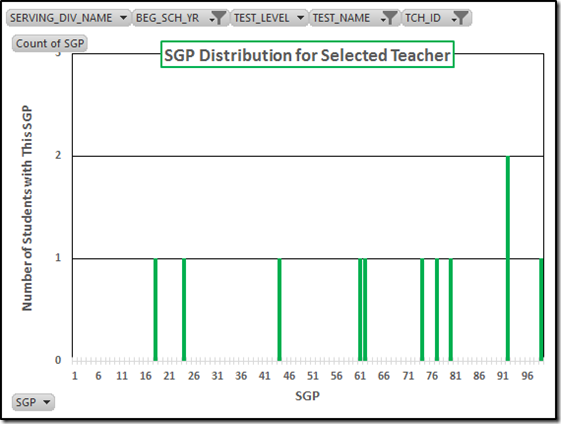 The “Row Labels” column contains the (anonymized) teacher IDs. 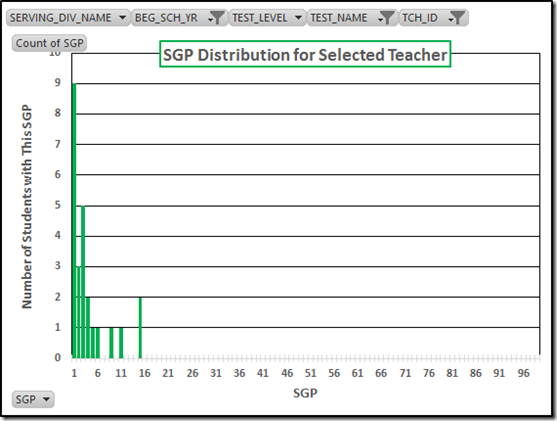 The “Grand Total” column is the three year average for each teacher. 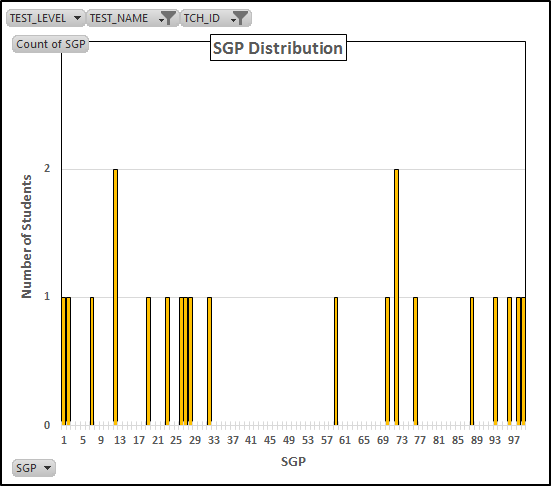 The “Grand Total” row reports the statewide average of each column. 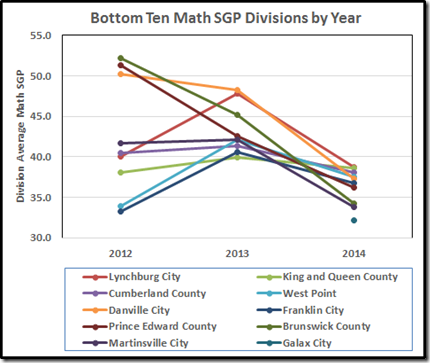 All but three of the 43 teachers at the bottom of the SGP list damaged Virginia schoolchildren for only one year; almost half of the teachers in the present list helped educate Virginia schoolchildren for more than one year. 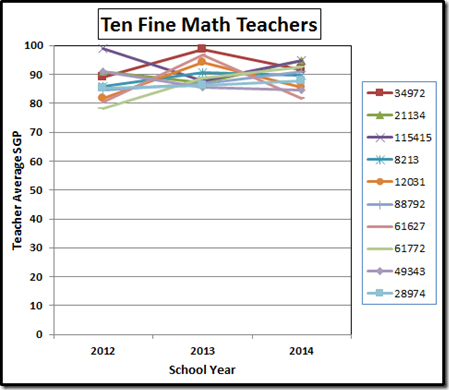 Here are the Top Ten who taught all three of the years for which we have data. Notice that all but two of these got better performances from their students in 2014 than in 2012. And, of those two, No. 115415’s even 99 in 2012 and much lower average suggest only one student (of doubtful statistical significance) in the first year and substantial progress over the second two years. 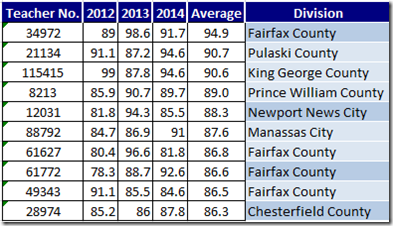 The preponderance of NoVa suburbs in this list raises the question whether those divisions have better students, or better teachers, or some combination. 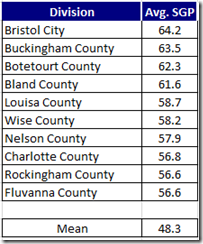 See below for some data suggesting that there is more learning, and presumably more teaching, is in some more rural districts. 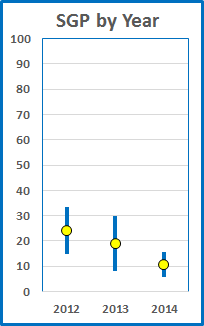 In the meantime, here are data for the Top Ten in graphical form. 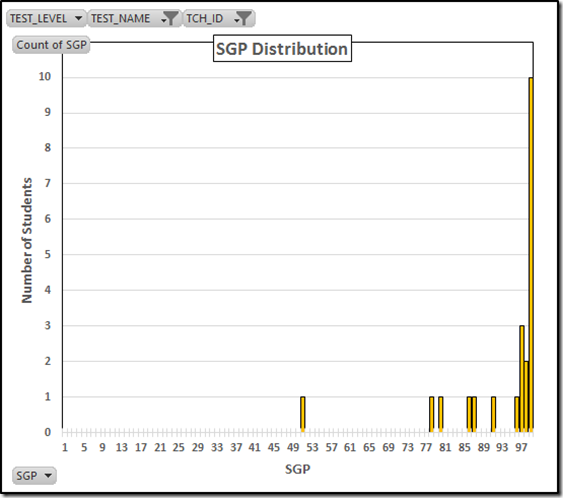 The division averages provide some further insights. 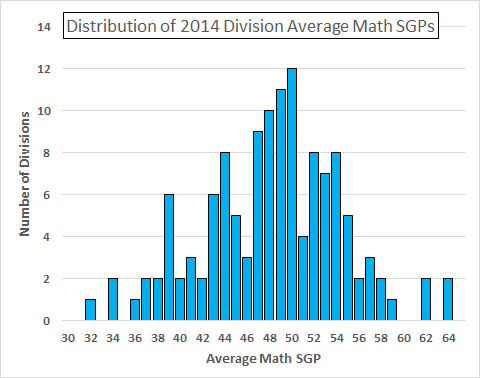 Let’s start with the distribution of division mathematics averages for 2014. 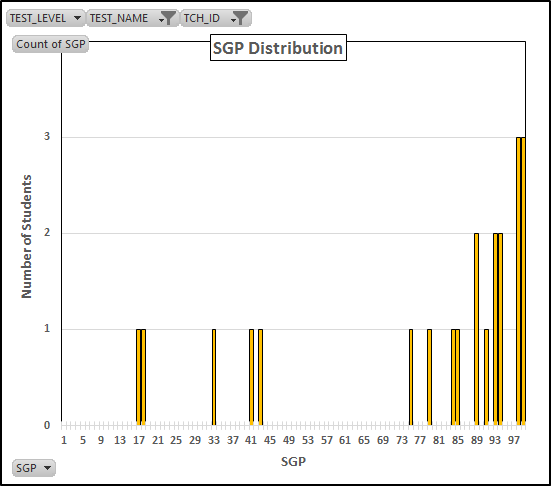 As shown above, the mean math SGP in 2014 was 49.1. 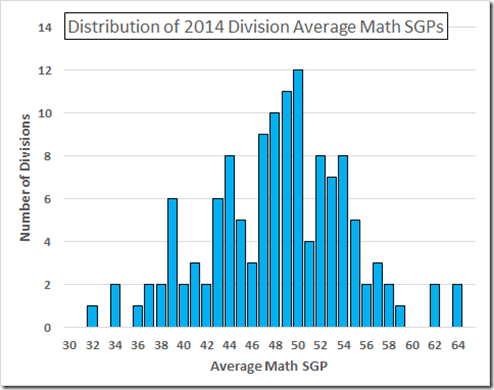 The division mean was 48.3, with a standard deviation of 6.2. 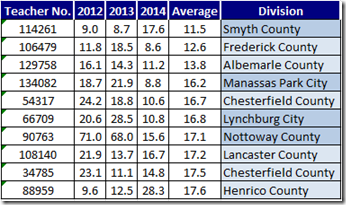 The Top Ten divisions of 2014 did not include any of the NoVa suburbs. Neither, for that matter, did the bottom ten. 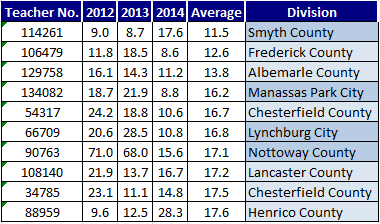 Here is the entire 2014 math list, sorted by division (Colonial Beach, Craig, and Surry had no data). 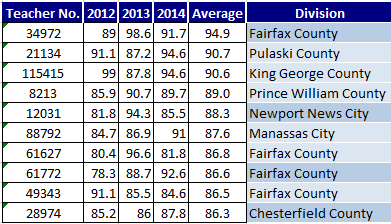 When we turn to the division averages by year an interesting pattern emerges: The Top Ten in 2014 all improved from 2012. 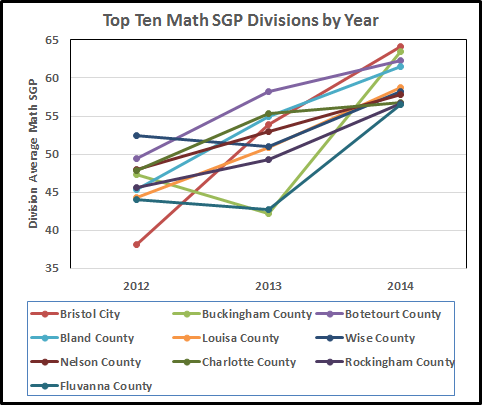 Seems to me that a whole bunch of educators should be put on a bus to one of these divisions to find out how to increase student performance in math. 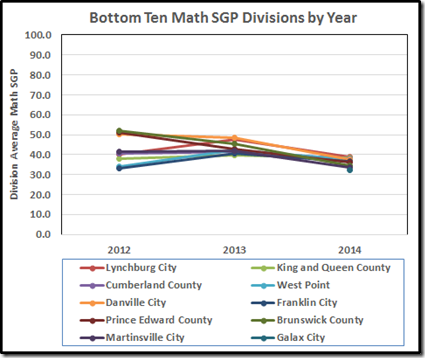 The Bottom Ten in 2014 mostly declined from 2012, except for Franklin and West Point, which improved; King and Queen, which improved slightly; and Galax, which only had data for 2014. 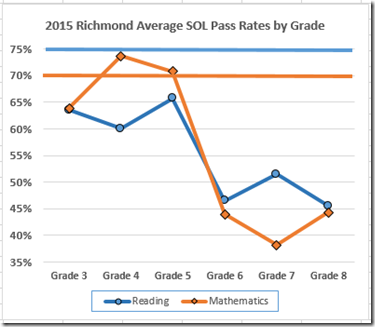 But the Virginia Department of “Education” and the Virginia “Education” Association don’t want you to see these data. Apparently you are not qualified to know what you are getting (or not getting) for your tax dollar. 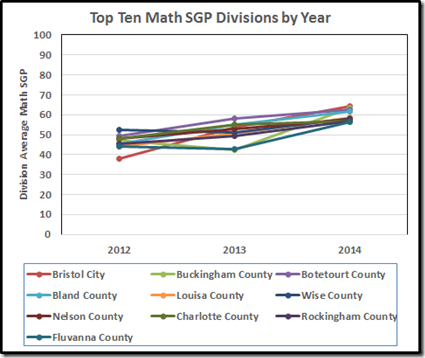 The SGP data that Brian Davison sued out of the State Department of Data Suppression last year showed (e.g., here and here) that we have some truly awful teachers in Virginia. 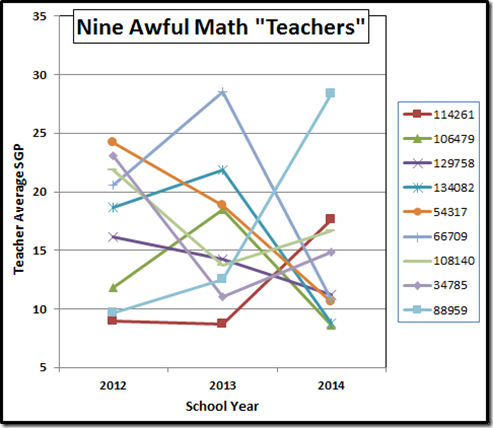 The lawsuit threatened by the Virginia “Education” Association demonstrates that it is more interested in protecting those bad teachers than in the effect of those teachers on Virginia’s schoolchildren. 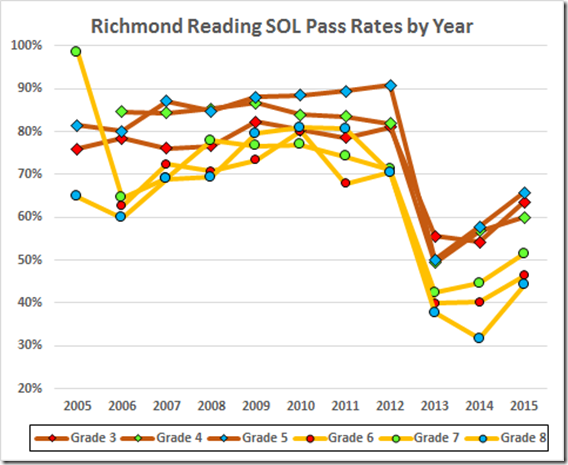 And the VDOE’s own document, confirmed by the available data, admits that the teacher evaluation process has been worse than ineffective. 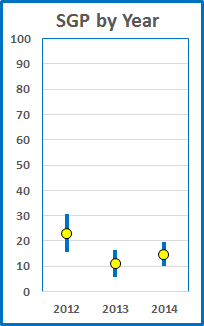 I’ve turned to the math data to provide some details. 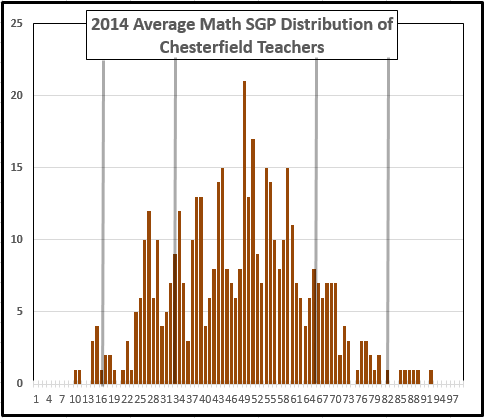 A list of the very worst three-year teacher average math SGPs offers some Good News and some very Bad News. 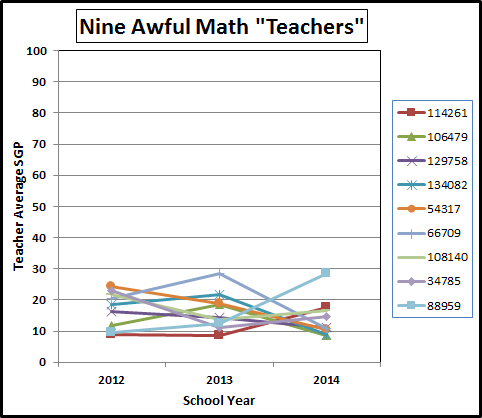 The Bad: Some truly awful teachers have been inflicted on Virginia’s schoolchildren, sometimes more than once. 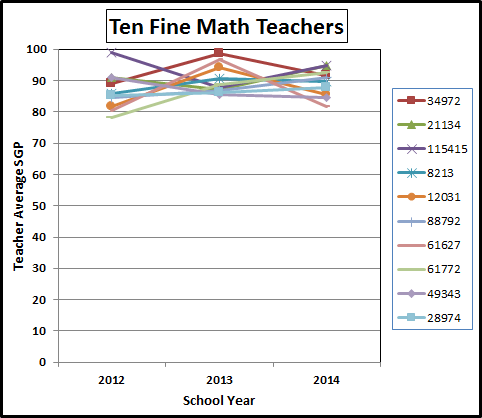 The Good: Most of those teachers from 2012 and 2013 were not there the following year. 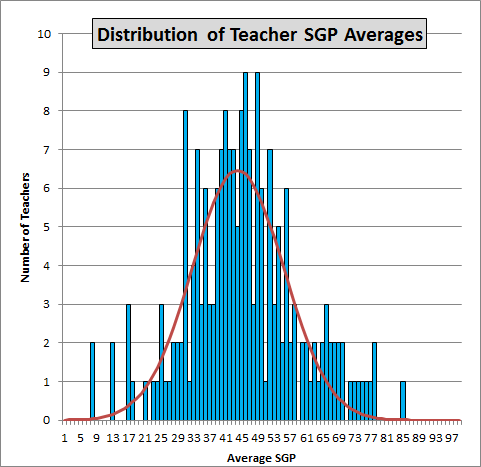 Here are the worst 43 three-year math SGP averages by teacher, sorted by increasing average. 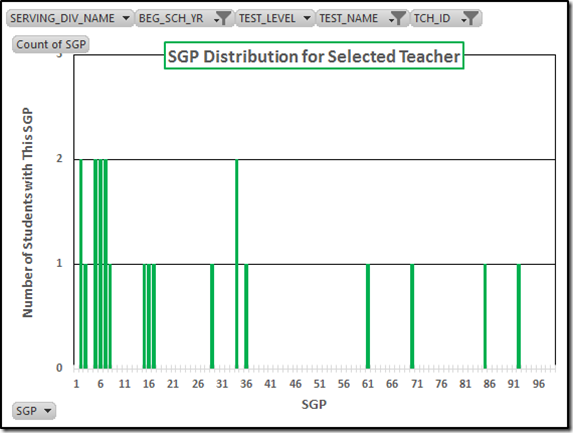 The “Row Labels” column contains the (anonymized) teacher IDs. 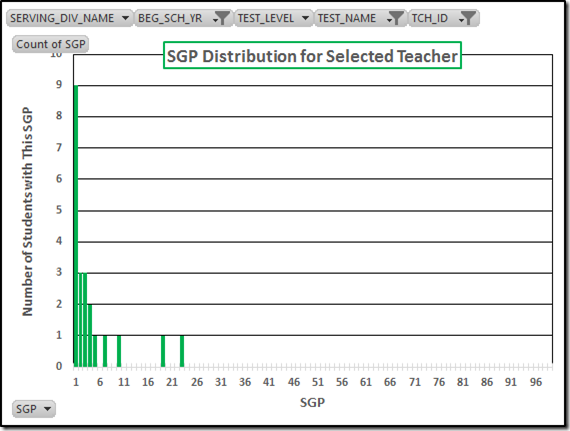 The “Grand Total” column is the three-year average SGP for each teacher. The “Grand Total” row is the statewide average for each year and for the teacher averages. 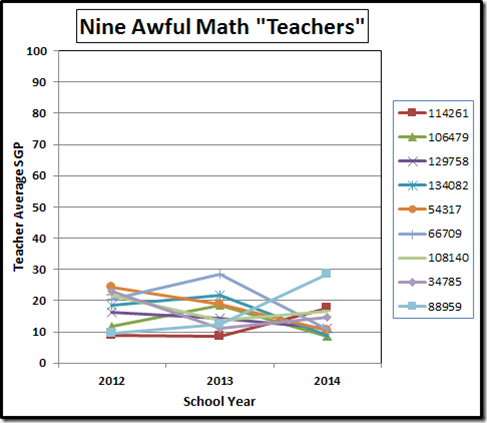 We can’t tell from these data whether any of the teachers with only 2014 results stayed on to harm schoolchildren in 2015. 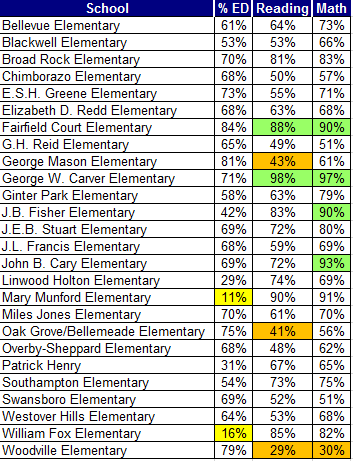 The yellow highlights identify the two teachers who came back after a failure to teach in an earlier year. 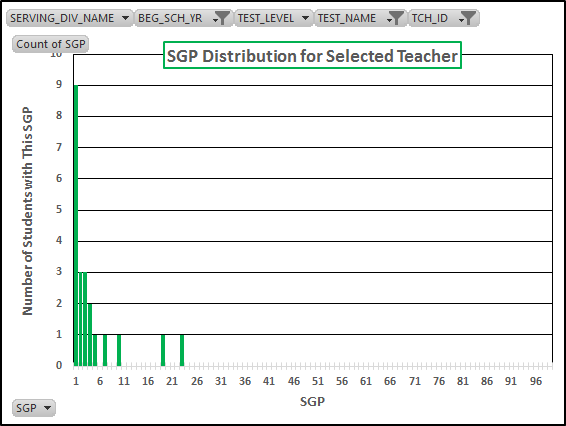 The red highlight indicates the teacher with the lowest average SGP among those who “taught” all three years. No. 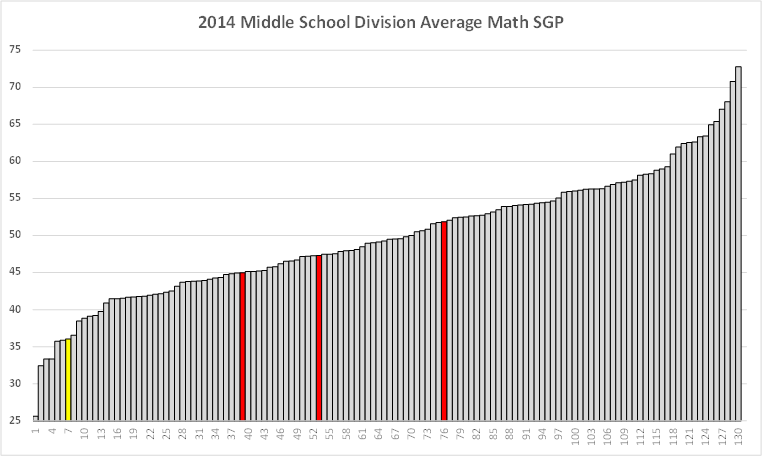 90763 is an outlier here: The three year average of 17.1 comes from yearly averages of 71.0, 68.0, and 15.6. 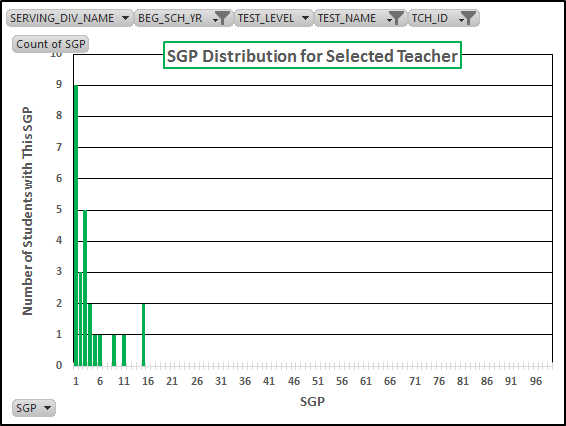 The “.0s” are clues: This teacher likely had only one reported SGP for each of the first two years and a much larger class in 2014. Indeed, the database shows 72 math SGPs in 2014. If we add the 15.625 average that year times 72 to the 71 and 68, and divide by 74 we get 17.08, the three year average for this teacher. That said, no telling what else unusual was going on there. 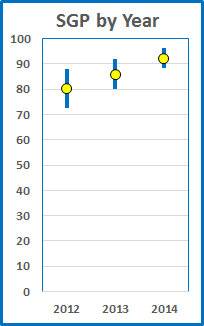 Only two of the nine showed improvement over the three-year period. No. 88959 went from a 9.6 to a 28.3, which is still more than twenty percentiles below average. No. 114261 improved, but only to 17.6. We have no data regarding the guinea pigs students who were damaged in these experiments. 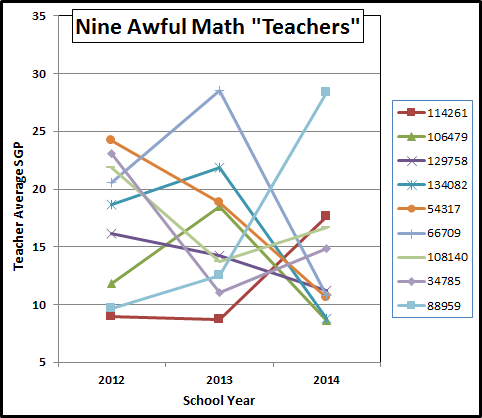 The other seven “teachers” all showed deteriorated performance over the period. Note especially No. 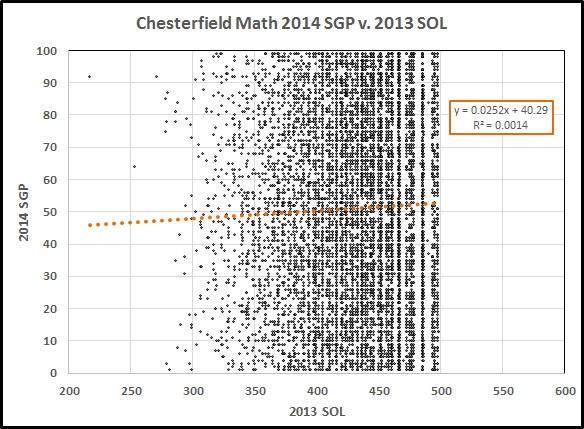 54317, who went from bad to appalling (and was paid tax dollars to continue afflicting Chesterfield County schoolchildren). 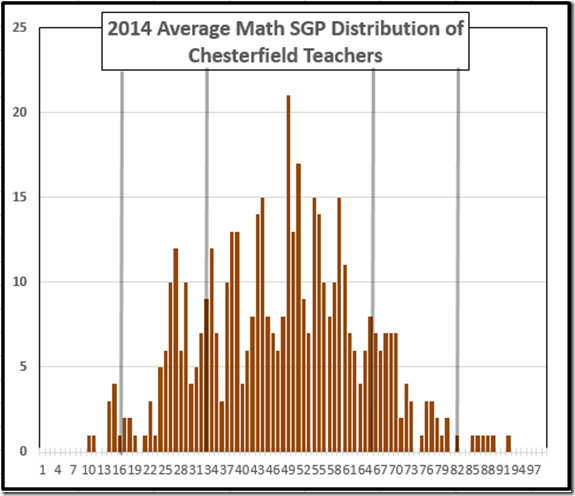 There are as many as nine principals (depending on time frame in the job and whether it was one or two schools in Chesterfield) who should have been fired over these disasters. I’ll bet you a #2 lead pencil they all got raises. But, the Virginia “Education” Association and the State Department of Data Suppression don’t want you to know about this, especially if your kid is suffering under such an awful “teacher” and such a pusillanimous school system. 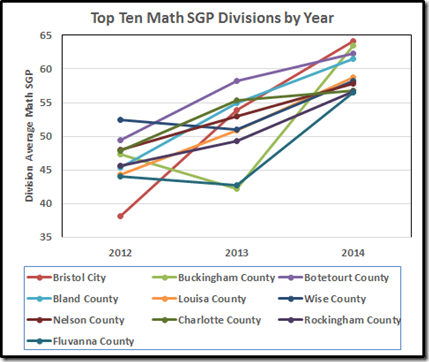 Turning again to the SGP data that Brian Davison sued out of VDOE last year, let’s look at mathematics. 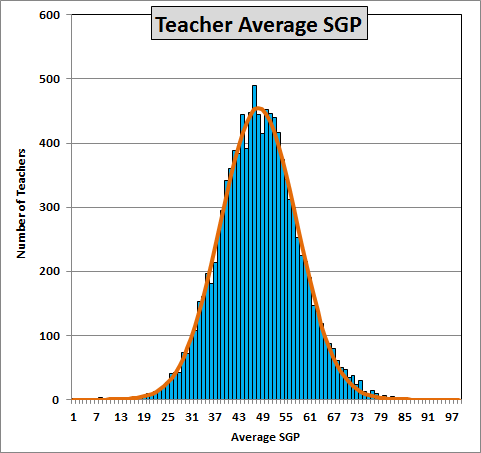 We can resist the temptation to dismiss this as the result of a class full of very bright students: Students who scored in the advanced “proficient” range two years running didn’t get an SGP (it’s hard to show growth from really-good-already). 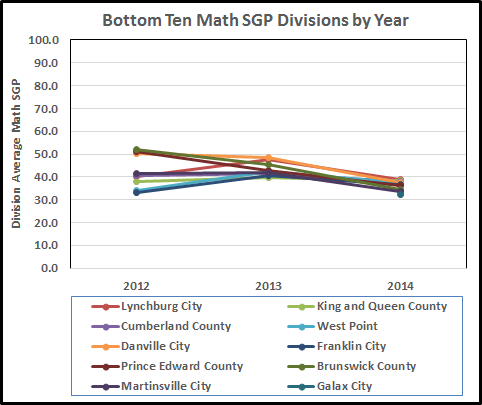 Thus, the students reported here did not obtain superior scores in both 2013 and 2014; they improved radically in 2014, compared to the others in Virginia who had similar performances in 2013. 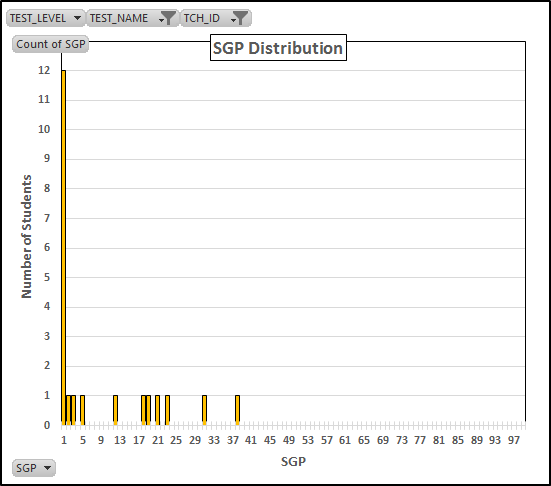 We can think of all kinds of explanations for this pattern. In the absence of other data, Friar Occam would tell us to look first at the simple one: This is a superior math teacher and an above average reading teacher. At the other end of the spectrum, we have No. 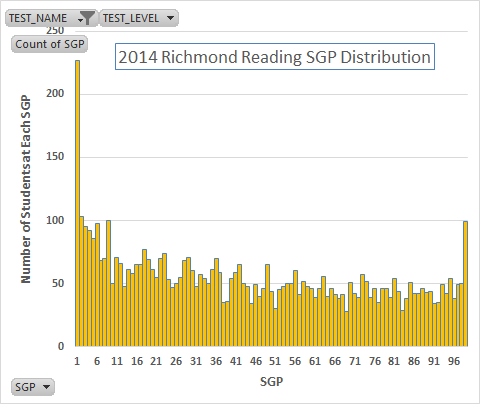 76323 whose fifth grade math students in Richmond averaged an SGP of 4.0. The Virginia “Education” Association has threatened to sue because it doesn’t want you to know about this teacher. But you can bet that the Richmond School Board members, Superintendent, principals and teachers knew and that none of their kids was among the unfortunate 25 in No. 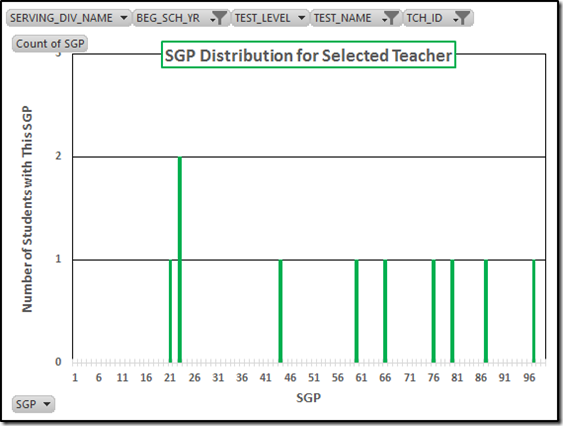 76323’s class. 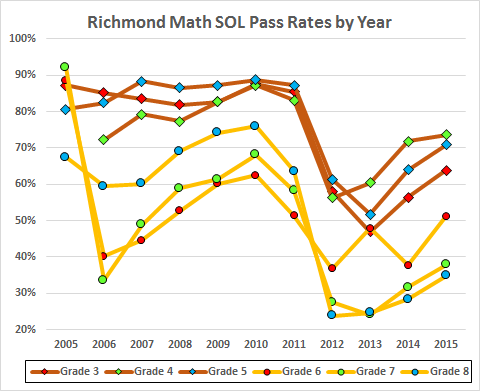 This suggests that there is a place for this teacher in Richmond, just not teaching math (absent some heavy-duty retraining). 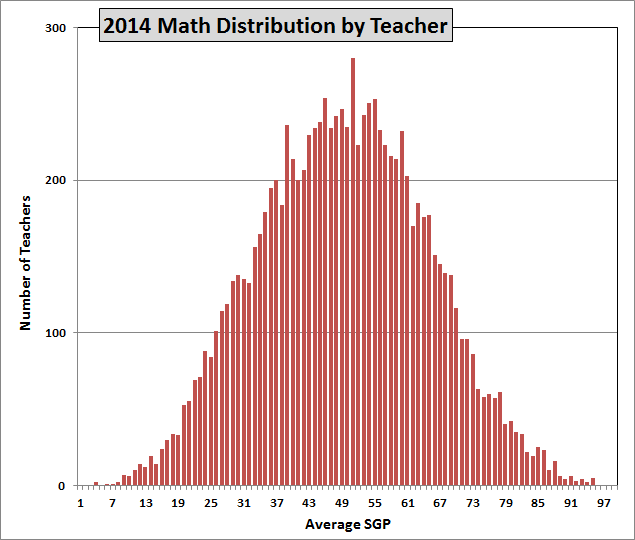 The second worst 2014 math performance comes from fourth grade teacher No. 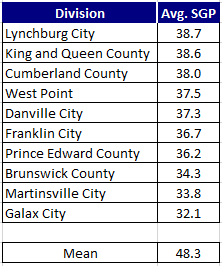 71819 in Lynchburg, with an average of 4.4. This same teacher turned in a 25.7 in reading. So, one awful performance and one clearly sub-par. You can again bet that no child of a School Board member, the Superintendent, or any Lynchburg principal or teacher was damaged by this teacher. All the schoolchildren of Lynchburg (and their parents who pay the teachers) deserve to be protected from this teacher, and the too many others who are nearly as bad. 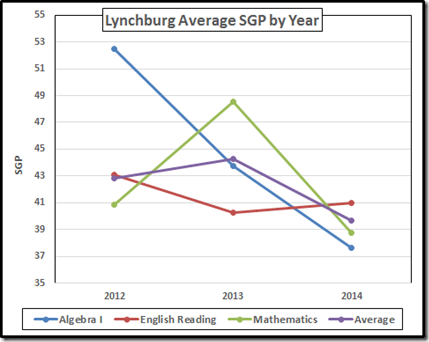 Another twenty-nine Lynchburg teachers averaged a math SGP of less than thirty in 2014; eight of those were less than twenty. 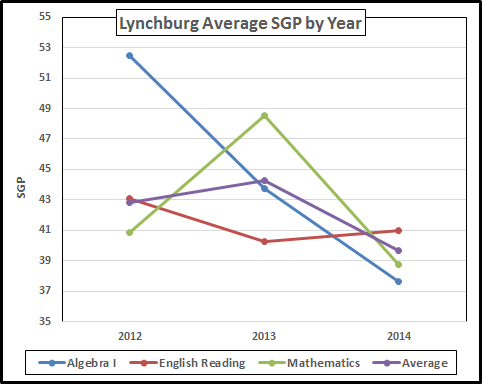 The 2014 reading performance in Lynchburg was less horrible: One teacher was below an average SGP of twenty, another six were between twenty and thirty. 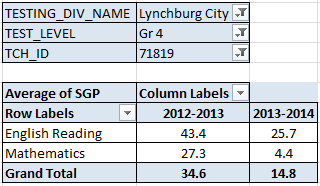 The SGP data from 2012 to 2014 tell us that Lynchburg’s average performance was sub-par and deteriorating. 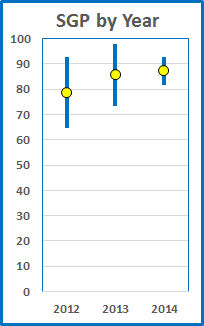 99 percent of teachers were rated as satisfactory when their schools used a satisfactory/unsatisfactory rating system; in schools that used an evaluation scale with a broader range of options, an overwhelming 94 percent of all teachers received one of the top two ratings. 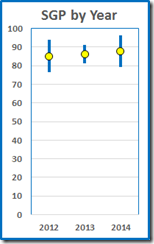 The only Virginia data we have on performance evaluations for teachers are from 2011. 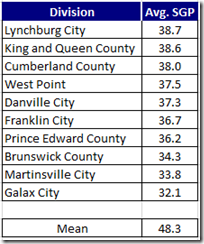 That year 99.3% of the Lynchburg teachers were rated “proficient”; 0.1% (one of 731) were “unacceptable – recommend plan of assistance”; 0.5% (four of 731) were “unacceptable – recommend non-renewal or dismissal.” Looks like Lynchburg, like Richmond, thinks it is the Lake Woebegone of teachers. Indeed, it looks like there was little thinking involved and the evaluation process was a bad joke. I have a Freedom of Information Act request pending at VDOE to see whether their new process is any better (or whether they are part of the VEA conspiracy of secrecy). The Virginia “Education” Association is threatening to sue VDOE, Brian Davison, and me because they don’t want you to know whether your kid is being subjected to a lousy teacher. Their behavior demonstrates that their mission is protecting incompetent teachers, not advancing “education.” That makes the very name of the Association an exercise in mendacity. 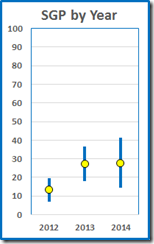 Seems to me City Council should demand, as a condition of all the money they are spending on [the schools], an audit of teacher performance (SGP in the past, progress tables going forward) with an analysis of Principal and Superintendent actions regarding underperforming teachers. 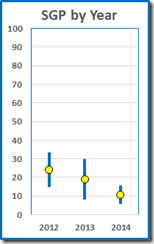 For sure, if Council doesn’t demand those data, the rest of us will continue to be operated on the mushroom principle (keep ‘em in the dark, feed ‘em horse poop). It looks like I’m being sued. Yesterday I received by email a “Petition for Injunction” for VEA and others against VDOE, Brian Davison, and me. 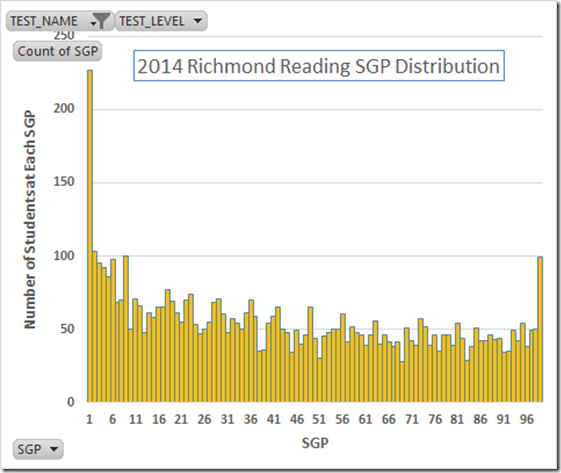 The Petition asks the Richmond Circuit Court to enjoin VDOE from releasing SGP and related data and to prohibit Brian and me from using such data. Well, as to the name of the court I’m being unduly kind: The Petition is addressed to “The Circuit Court for the City of Richmond” (emphasis supplied). There is no such court. By statute, our circuit court is “The Circuit Court of the City of Richmond” (emphasis supplied again). So, the Petition, if it is genuine, demonstrates at the top of the first page the ignorance of the VEA’s lawyer. The body of the Petition, entirely aside from any legal merit (actually, lack thereof), illuminates the unfortunate truth that VEA is more interested in protecting incompetent teachers than in furthering the educations of Virginia’s schoolchildren. Of course, “Esquire” is a courtesy title, mostly applied to lawyers. So we have Ms. Rosenkrantz stroking herself with a courtesy title. As well, the “Esquire” is redundant: The Virginia State Bar number, required by Supreme Court Rule 1:4(l), tells us she is a lawyer. It’s hard to imagine a lawyer with an ego so shrunken that she feels a need to be courteous to herself and to tell us she is a lawyer lawyer. But it seems the VEA has found one. 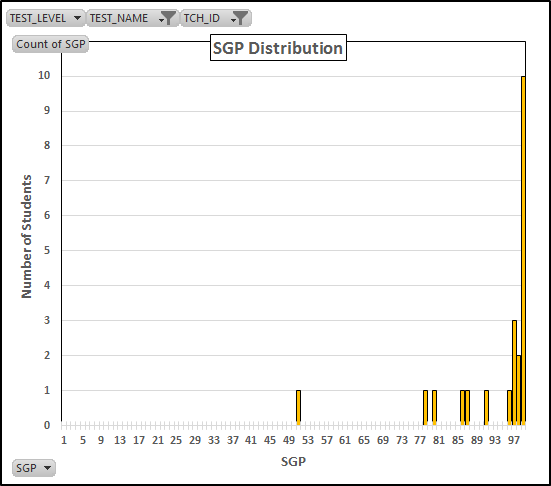 Indeed, it looks like there’s an epidemic of insecurity over there. The signature block of the purported law clerk who sent the email starts: “Catherine A. Lee, JD.” Really! A law clerk who feels the need to tell us she has a law degree. Remarkably, she didn’t attach a law school transcript to show how smart she is or a picture to show how pretty. Let’s hope this Petition is not a prank and that it will be filed at the courthouse and served on Brian and me. Dealing with a lawyer at that level of ignorance and with that defect of ego, who is attempting to keep Virginia’s parents from knowing whether their kid is being damaged by an incompetent teacher, should be good fun. Moreover, VDOE’s lawyer is a competent and affable fellow. To the extent he is on Brian’s and my side, or even to the extent he isn’t, those qualities will enhance the enjoyment. P.S. : I have created a new email account for this litigation: 4students_unlikeVEA@outlook.com. If you know where and what the Richmond plaintiff, Bradley Mock, teaches or whether he is the same “Bradley Mock” who studied “Hip Hop Culture” at VCU, please do use it to send me an email.